The city of Charleston, S.C. is a historical, haunted, and exciting city to visit any time of the year, but especially during the month of October. The Charleston Ghost and Dungeon Walking Tour was named as one of America’s most haunted places and shown on The Travel Channel for good reasons! Experiencing the Charleston Ghost and Dungeon Walking Tour in October is wonderful! In October the air is usually cooler and crisper and it is the exciting beginning of a new season. Halloween is a fun, spooky, and enjoyable time to get out and become involved in some outdoor or semi-outdoor activities. The Charleston Ghost and Dungeon Walking Tour is a 90 minute walking tour that lets tourists experience Charleston’s haunted historic district. 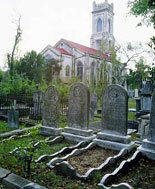 The tour includes a visit to the Holy City’s cemeteries, churches, dark alleys, and a pre-revolutionary dungeon. The Dungeon was actually a prison in the late 1700s. It has positioned, rounded ceilings and columns made of brick. The Dungeon was a damp, cold, and eerie place that had no way of providing heat. Pirates, patriots, and criminals died behind the bars of the dungeon. If you love ghost stories, this is the tour for you! The underground tunnels and the stories to go along with them are fascinating. Learning about Charleston, its historic and haunted areas, and hearing ghost stories, as well as pirate stories are all very intriguing. You’ll experience an eerie walk while you listen to a knowledgeable tour guide tell true, chilling stories of Charleston’s ghostly citizens, haunted houses, voodoo, and low country superstitions. Be sure to bring comfortable walking shoes and a camera.